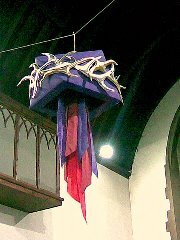 Two banners and a crown of thorns, made by St Paul’s Textile Group, were on display in the church over the period of Lent. 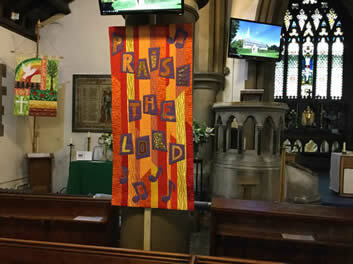 The banners were long and slender, designed for mounting on pillars, and they were situated near the front of the church, on either side of the central aisle. One was a machine quilted ‘mosaic’ design in purple and yellow fabrics on a black cotton background. 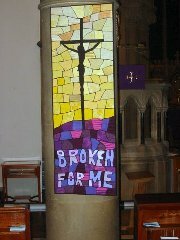 The careful placing of the yellow mosaics produced a silhouette of Jesus on the cross, while paler mauve fabrics on the purple hillside formed the words ‘Broken for Me’. 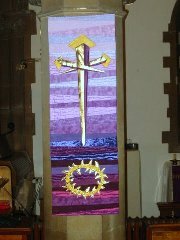 The other banner featured a gold cross of nails and plaited crown of thorns appliquéd onto a machine quilted background of various textured fabrics, graduating in colour from pale mauve to deep purple. 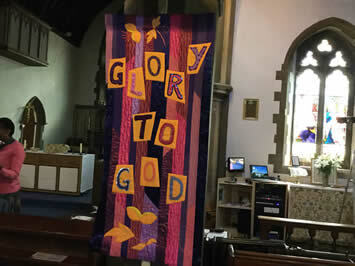 This banner was created by the Textile group. It was dedicated and placed in the Memorial Chapel on Remembrance Sunday 8th November 2009.
were installed on pillars in our church following Easter 2013. They were inspired by a verse from Isaiah, chapter 40 verse 31: "But those who trust in the LORD for help will find their strength renewed. They will rise on wings like eagles; they will run and not get weary; they will walk and not grow weak." Made by our Textile Group of eight talented ladies, who, as well as beautifying our church, make items for sale at our summer and Christmas fairs, the proceeds of which go to the Kenyan street children feeding programme. 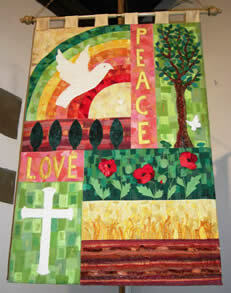 The banners were made of hand painted silk with appliqued sun and figures in satin, outlined with couched threads. The grass was painted with fine brushes, enhanced by free machine stitching. 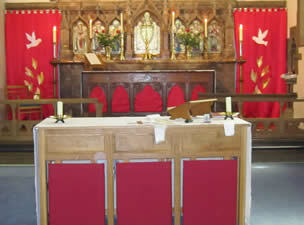 It is hoped these banners will bring comfort to those who visit our church. Two more Banners made by our talented Textile Group in April 2017.